Due to the failed environmental policies of this guy, and this guy, and this guy, the nations of earth decide to inject a chemical into the atmosphere in a desperate gamble to counter the effects of global warming. This fails, and most life on earth is wiped out. 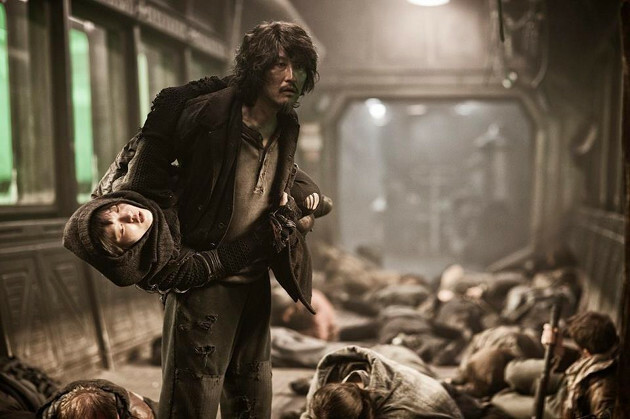 The only people left alive, are the rich folks that managed to buy a ticket on the Snowpiercer, an awesome train that is planning on circling the globe for the rest of eternity, as well as the poor people who manage to sneak on at the last minute. 17 years later, the poor people aren’t happy, and they turn to Chris Evans to save them. That’s the premise of Bong Joon-Ho’s Snowpiercer, an(mostly) English language film that has been a massive hit in Korea and other asian countries. It’s a premise full of promise & potential, and has been a bit of a cause celebre among film fans this year, as evil Harvey Weinstein had previously refused to release Joon-Ho’s cut of the film in North America. He has since acquiesced, but only in limited release. Joon-Ho is so enthralled with his concept here, that he can’t seem to figure out what kind of movie to make around it. Should he make a balls-to-the-wall thriller? The bones for that are here, and one could see how Harvey Weinstein would have thought that’s what he was getting when he picked up the rights. Or should he make a cerebral Brazil/12 Monkeys homage? Joon-Ho goes as far as to name one of his lead characters Gilliam, so his preference is fairly clear. 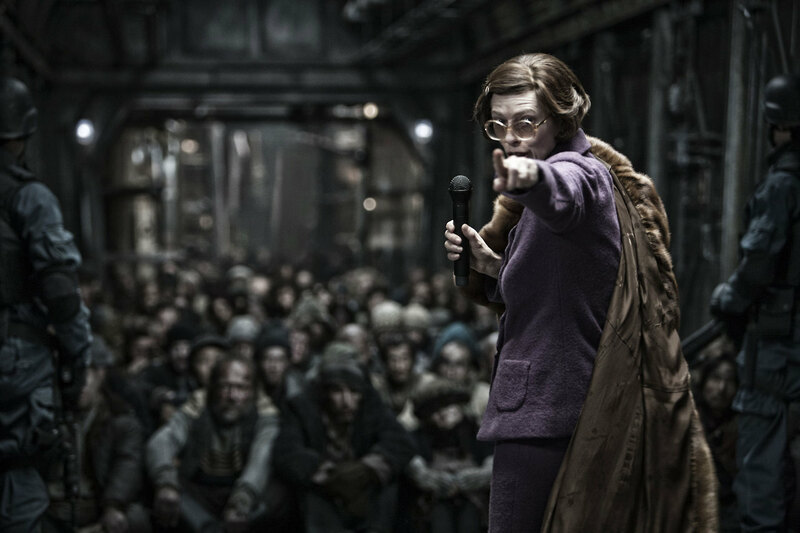 But Snowpiercer is far too actiony, and it’s characters too one-dimensional, to fully take its place among such other dystopian classics like Blade Runner or Children of Men. And it’s too preachy, and too sentimental, to be compared to other excellent modern thrillers like Looper & Source Code. 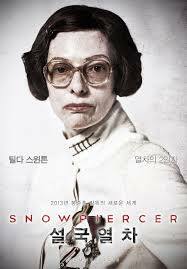 So what does Snowpiercer get right? Firstly, it’s exciting. We know what the stakes are, and the desperation of Chris Evans’ crew is palpable. They are literally fighting for the future of the planet here. They’d rather die, than accept another day under the status quo. Secondly, Tilda Swinton. Her role as the public face of the evil villain who is actually running the train, is absolutely inspired. Her character’s over-the-top fascism is probably the film’s strongest link to movies like A Clockwork Orange or 1984. The movie suffers every time she’s not on screen. Thirdly, the concept of the piece. I’ve mentioned it before, but the concept is so strong, and so timely, that it really does make up for any other perceived shortfalls. Quite frankly, this film is screaming for Showtime or AMC to turn it into a TV series. There is so much backstory left on the table here, and so many unanswered questions, that I found myself making up scenarios in my head to answer them. There is plenty about this film that is entertaining and worth discussing, mostly having to do with the fact that we may only be decades away from a similar fate. However, all I could think about was how much the film left unsaid. This entry was posted in Movies and tagged Bong Joon-Ho, Movies, Snowpiercer. Bookmark the permalink.